(Lihue) – Rapid ʻŌhi‘a Death (ROD), a disease killing ʻōhiʻa trees, has been confirmed at two new locations on Kaua‘i. Since ROD was discovered in Moloa‘a State Forest Reserve in 14 trees earlier this year, a collaborative team of scientists from state, federal, and private organizations has been working together to survey the island and develop response plans to an introduced disease threat facing Hawai‘i’s native tree. 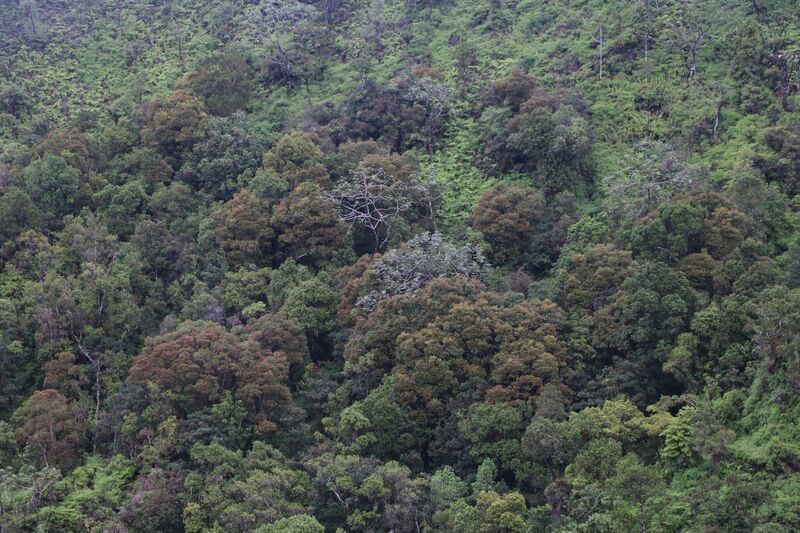 ʻŌhiʻa is considered foundational to Hawaiian forests and culture. Teams conducted aerial drone flights and helicopter surveys using digital mobile sketch mapping and identified 22 areas on state and private lands with ʻōhiʻa trees showing symptoms consistent with the disease. So far in 2018, 76 samples have been collected and submitted for lab testing. Since the Moloa‘a detection in the spring, three more trees have been confirmed to have Ceratocystis huliohia, the less virulent of the two species of fungi that cause ROD. On Hawai‘i Island, scientists at the U.S. Department of Agriculture identified the two-different species of fungi that cause ROD, C. huliohia and C. lukuohia. Both species are new to science. The new positive detections come from privately-owned land in Halelea Moku and near the Lihue-Koloa Forest Reserve. This locates ROD at three distinct locations on the island at elevations ranging from 600 to 1,600 feet above sea level. Providing a bit of hopeful news, some ʻōhi‘a trees on Hawai‘i Island are showing tolerance to the disease, as are some forest types. 3) Clean gear and tools, including shoes and clothes, before and after entering the forest and areas where ʻōhiʻa may be present. Brush all soil off tools and gear, then spray with 70% rubbing alcohol. Wash clothes with hot water and soap. The visitor industry can help, too, by adopting bio-sanitation practices. On Wednesday, December 12, from 1:00 to 3:30 p.m., land-based tour operators are encouraged to attend a free workshop on how to prevent the spread of Rapid ʻŌhiʻa Death on Kaua‘i. The course covers best sanitation practices for tour operators so guides and guests can feel confident about minimizing their impact on Kaua‘i’s native landscape. The workshop will be held at the Kaua‘i Agricultural Research Station at 7370-K Kuamo’o Road in Kapa‘a. Interested parties can sign up at www.rapidohiadeath.org. Registration is required. You can learn more about ʻōhiʻa, its role in the culture, and ROD on Tuesday, December 11, 2018, starting at 5:30 p.m., at the Kaua‘i premier of “Saving ‘Ōhiʻa.” The documentary is part of the collaborative National Tropical Garden-Kauai Community College ‘Earth Matters’ public lecture series and will air in the KCC Campus Center Cafeteria (behind the Performing Arts Center).